Belcarra Technologies’ USBLAN class driver for Windows is a Microsoft Windows networking-over-USB solution compatible with both the older CDC-ECM and the more recent and higher performance CDC-EEM. USBLAN is available for Windows 2000 and Windows XP with Vista versions expected soon. Belcarra has followed the progression of USB’s use for connecting network peripherals of all types. 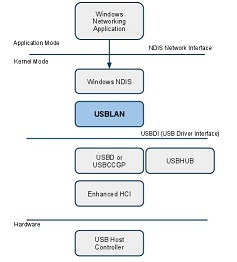 As a pioneer in the provision of driver software both for smart peripherals as well as for the desktop operating systems that support them, Belcarra has produced USBLAN, which enables smart peripherals to share data across the USB fabric as if they were connected to an otherwise normal TCP/IP network via Ethernet. Belcarra’s USBLAN Network Class Driver implements an Ethernet-based Internet network function using either the CDC-EEM (Ethernet Emulation Model) sub-class for transporting Ethernet frames over USB or the CDC-ECM (Ethernet Communications Model).